With the way the NT has been simulating everything for the World Cup, I'm starting to finally feel like the World Cup is a reality. Up until now, it felt like an abstract concept, but now no more dreaming, it's real and it's closing in...! The simulation was done from start to finish -- the National team landed in Bonn and were whisked off by a bus just as they deplaned, no going through the immigration process. I mentioned before that the accomodations have all the usual facilities required (pool, etc., and the players are relieved to find internect connection), and the training ground and everything else is all done as if it were the World Cup. The usual NT chefs and nutritionist are also simulating their menus and shopping around Bonn for ingredients that they need (there are many Japanese foods available there, so they won't have to carry much over). Of course, there are some things that cannot be simulated -- like the weather. And knowing this team, it is almost inevitable that smooth plans would be thwarted by a healthy amount of snow. As Zico joked to the media, we've seen it all -- typhoon, planes being delayed, earthquakes, torrents, blackouts, and no-spectator games... now snow. Hopefully there will be none of that at the game tomorrow. It is too bad because today was the only day in which the entire team was at practice (most from Urawa and Gamba rested back at the pool yesterday with the physical therapist, and the 4 remaining Europe-based players only joined the team today). But that is life, and though there was some possibility of moving the practice indoors, Zico decided to just have their training session outside anyway, and after doing some drills, the squad was aplit into starters and bench for a mini-game. So I was right about Kubo (not a tough call there) but wrong about Hide. It sounds like Zico is bringing together the Confederations Cup group with Kubo in for Yanagisawa. But it is the last chance for the European players to come together, so don't worry I'm sure Zico will make substitutions. As much as I want to see everyone play, it's senseless to throw everyone in willy nilly, and it is probably more important to see what kind of balance and chemistry can be maintained/created. Of course Zico always goes for the win, so the substitutions will also depend on how the game unfolds. The general atmosphere in the team is good, with emphasis on using the valuable game time to seek out strengths and weaknesses, make adjustments, and play with focus on unified movement. It's my birthday tomorrow, and I am hoping they will give an elegant and winning performance. For those of you eager to get more info on Serbia & Montenegro league club Red Star, and news of Takayuki Suzuki, This English site kindly translates Serbian news. They have posted an interview with Suzuki right after he arrived there. For Suzuki's interview, go to the News link on the left column, choose News Overview, and the article was posted 15.2.06. Koji Nakata started for the second game at his new club Swiss league's superclub FC Basel this Sunday against Yverdon. The system used was 4-4-2, and Koji was a left midfielder, and throughout much of the game played almost like a wing. At the 7th minute, he took the first shot of the game. He continued to play ambitiously, maintaining a high position, which led to his goal at 45 minutes -- a header off a cross from the left. >>This Swiss news site has video highlights. At the top of the page, there is a chart/list of the fixtures under the heading "Videos", find the icon on the right that corresponds to the Basel vs Yverdon game. Koji is #6. For more pics, check out FC Basel's >>photo gallery. Since Koji did not score during his time at Marseille, this is his first "overseas goal". And his first goal since the goal he scored against China during the 2004 Asia Cup Finals. Congrats, Koji! He was taken off at halftime, and got a warm round of applause from the supporters. As for how he is getting along at the club, Koji said on >>his website that he is really liking it there. The team has a very tight family atmosphere and people have been kind. Though the official language is Swiss German, many players also speak French and/or English. Because Basel pretty much outpowers all the other clubs in the league, the real juice may be in the UEFA games -- Basel are in the same group as Red Star (where Takayuki Suzuki plays), but I think Koji is not registered to play in UEFA yet. Tickets for this game apparently sold out with 45 minutes of going on sale, and it was a great pre-season event, heating things up for the opening round of the J1 season (J-league starts on March 4). Needless to say, these two teams are at the top of the watch list this season, after bringing in some notable new transfers. Despite the result, and the fact that it was a game with a title at stake, the Gamba side are not demolished by the outcome of the match in terms of their optimism regarding the season. 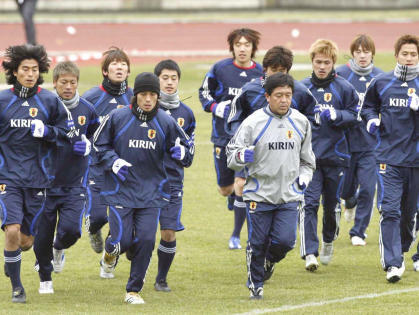 Due to national team responsibilities, Endo, Miyamoto, and new transfer in Kaji (from FC Tokyo) have barely trained with the team, and only Endo was started in this game from the NT group. In the first half, Gamba looked understandably awkward. First, with goal-getters Oguro and Araujo gone (these two alone scored the majority of goals last season), new acquisition Magno Alves (from Oita Trinita) was left stranded up top and the team couldn't find much in the shape of attack. They got the first goal off a set piece, but that was an own goal. New transfer Myojin (from Kashiwa Reysol; many of you probably remember him from his NT days) was placed as right defender in the 3-back formation, but that is not the position he has normally played, and there was a certain amount of discomfort in the communication there. Still, he has a lot of experience and wasn't so bad. And with the play being balanced by Endo and Hashimoto in midfield, there was a certain degree of potential seen in the attack. In the second half, Gamba manager Nishono decided he would throw Kaji into right back and change the system to 4-back, and sent in forward Bando (from Vissel Kobe). These two made a positive difference to the team, and there was more flow to their game. Reds lost some of their momentum with the score at 3-1, but it was clear that Gamba was controlling more of the second half and made a number of promising plays. The problem being with that last bit of finishing and timing. Bando tangled nicely with his teammates, keeping an eye on their positioning; Kaji's strength on the right, moving up and down the length of the pitch, brought more variation. For Urawa, this was the first step in a year that promises to be perhaps their biggest, in terms of winning the league title. Their new squad gives off an unbeatable impression -- not only do they have Ono back from Feyenoord, they got Washington (from Tokyo Verdy), not to mention the many other players who have been tied to the national team in the recent year. And waiting in the wings is Tatsuya Tanaka, and new transfer Soma (from Verdy) who many expect will threaten Santos' place on the left. And then you have Ponte, who is now even more free to play creatively with Ono next to him sharing the game making responsibilities. Before the game there were some concerns about the balance, with Washington up top, Ponte and Ono under him, Hasebe and Keita Suzuki behind them. Just a few minutes after they gave up the own goal to Gamba, Reds equalized off a FK from the left. At 17 min, a lovely vertical pass from Ono up to Washington allowed him a one-on-one meeting with the goalie, ending with a good shot for goal number two. At 51 mins, a mid-range shot from Ponte sealed the deal. What was most notable was the amount of pressure Reds put on in defense. The goal from Washington was set up first because the pressure Reds put on Gamba's possession forced them to make errors in passing -- that error was intercepted by Ono for the feed forward. The goal from Ponte also came from pressure as well -- Washington scrambled for a loose ball inside the Gamba box against two defenders, and the loose ball was pounced on by Santos and Ponte. Santos got possession and sent it to Ponte for the shot. In offense, we also saw Washington being used well (despite the fact that he still isn't quite at top form yet) -- he played post to allow Hasebe and Ponte and Ono up with quick little passes, and the tempo was very good. Horinouchi, despite being a defender, also was aggressive about timing his runs forward and was involved in several almost-goals. It feels like there is a sense of healthy competition within the club, now that there are almost more quality players than there are positions available. Things slowed down in the second half, after an almost too-spirited first half for Reds. And because Gamba put on the pressure by substituting Kaji and Bando, Reds manager Buchwald decided to take Ono and Santos off for Hosogai (left side) and Nagai. When questioned why he did not use Soma for Santos, Buchwald said that he wanted to stabilize the defense, and Hosogai was a more defensive player. Bonn is such a great name... I did a report on Beethoven when I was in grade school, so that's the first thing I think of everytime I hear the name. Funny how these things stick to you from childhood. The core group left Japan for Germany on Saturday, and those from Reds and Gamba took a later flight that met up with Zico and Daisuke Matsui (Zico attended Dai's Saturday game in France) in Berlin. It was defender Yuji Nakazawa's birthday this Saturday -- Happy Birthday! I remember doing a >>profile on him last year on his birthday, and it's very strange to think how quickly this year has gone. This morning the team, now joined by Nakamura, Matsui, Yanagisawa, and Oguro, trained in a light flurry of snow. I mentioned before that they are testing out the facilities they will be using for the World Cup (Japan's camp will be in Bonn), including the hotel and the practice grounds. Since Takahara, Nakata, Inamoto and Koji have games to play today (Sunday), they will only be able to meet up with the team on Monday, the day before the game. Since this is the last game that Zico has the authority to call his Europe-based players until June (aside from Yanagisawa, who is returning to Kashima this week), I wonder if he will force an all-Europe formation, or pick and choose according to balance. Will Hide be used as an offensive half? Probably, though we've seen countless times that he is better another step back. Will he insist on starting Kubo over Oguro? Probably, as Kubo is at the top of the forwards list, and Zico will want to see how he meshes with Nakamura (who loves him) and the others. The only thing preventing this would be if there is an issue about Kubo's condition. The formation will most likely be 4-4-2, but in what combination, I am not sure. From left to right: Nakazawa, Yanagisawa, Oguro, Miyamoto, Ogasawara, Nakamura, Tanaka, Komano, Matsui, Fukunishi. And in front, in grey is physical coach, Satouchi. The Xerox Super Cup will kick off on Saturday (tomorrow) at 13:35 Japan time. For those of you who can understand some Japanese, they will be broadcasting the coverage of the game >>Here via internet radio. At the time of the game, the red rectangular button on the left with the triangular play sign will be clickable. It should launch the media player and stream the coverage. The JFA announced the players who will be called for the upcoming friendly against Bosnia and Herzegovina. The game will take place on February 28, in Dortmund Germany at 13:20 local time. The significance of this game is that it will be played in the stadium that will host the Japan vs Brazil game, and the team will make a test run of their camp hq in Bonn. Sort of full dress walk-through rehearsal. The squad list is far from surprising. Most expect that this list below is going to be more or less the WC squad aside from the goalies. Though as you all know, all sorts of things can happen in the next three months... remember last time..
Zico left today for France in order to watch Daisuke Matsui play at Le Mans -- the game this Saturday is against St.Etienne. After that he will fly directly to Germany and meet up with the rest of the team. Goalkeeper Narazaki is still not in full form from his injury during the last game of the league last year, and was not part of the preview squad list. GKs Doi and Sogahata both were injured during Miyazaki training camp and were replaced just before the USA game by Urawa GK Tsuzuki and Sanfrecce GK Shimoda. Pre-match news, updates on National team >>Here, and >>Here, as well as game review to follow. * Yanagisawa is expected to repatriate to Japan, to J-league Kashima after this game in Germany. A hilarious and rather adorable commercial from Adidas's +10 campaign. The story is that both players have to put together a national team by finding fellow countrymen off the streets. Shunsuke is in Glasgow, making his task very difficult. He goes to a local Kendo class (Japanese fencing) and is asking "Are any Japanese here?" and the students take off their masks to reveal they are far from Asian. Then he goes to an English language school, and there appears one Japanese person, who mumbles, "I can't play football, but I can play the bagpipe!" So he plays a little... And it turns out the bagpipe player has 10 Japanese friends in the city, who he calls. DelPiero has a bit of an easier time, asking around the city for places where people are playing. An old man says he is too old to play, but he finds a group playing in a local court. He tries the players out, and picks his team. As you all know by now, we ended with a fairly good result against India in this first game in the Asia Cup 2007 qualifying process. It just occured to me on my way home today that Japan and Saudia Arabia have been the title holders since 1984 -- and both these teams are in the same Group A. We have played India 3 times in the past two years, and each time they are getting better. Ignoring the score for a moment, I think they played a much more focused game on defense, and showed moments of individual technique that we didn't see as much in the first two games. I also enjoyed Japan's away game in Kolkhata back in 2004, the one with the black outs and the unique atmosphere created by the home supporters. India started with a defensive 4-5-1 (or 5-4-1?) system, and then switched to putting two on top at half time when they were down by one. As predicted in my >>match preview, Zico switched system yet again (remember, in the US game we did 3-6-1, then against Finland 3-5-2) to bring back the 4-4-2 formation, with the use of 22 year old Urawa Reds midfielder Makoto Hasebe next to Ogasawara as an offensive half. It was his first start in an international game, not to mention this important must-win competition match. Of course the 4-4-2 has shown in the recent year that Japan are able to play a more fluid game. But it was the first time that Zico used a 4-4-2 system with an all-domestic roster. It was also probably used to get the team ready for the upcoming match against Bosnia, in which the European players will be called up and we will definitely be seeing a 4-4-2 system there. Takayuki Suzuki got his debut at Red Star this week in the game against Vozdovac, substituting in at 69 mins when his team were ahead by one. Messina's Atsushi Yanagisawa will be temporarily returning to J-league's Kashima Antlers to play in Japan until the summer. This means that now there are 0 Japanese players in Serie A.
Daisuke Matsui was voted Ligue 1 MVP for the month of January. He's gotten to be quite a popular player in France, and his inspiring goals and assists last month for Le Mans seemed to have made a strong enough impression. Zico has scheduled a detour to France before the Bosnia game (in Germany) to watch Matsui play in France. Koji Nakata made his Swiss debut starting in Basel's game against Schaffhausen. He was used as a midfielder. The team drew 1-1.